Order production through the Build Menu. Early in the game, especially if you are not playing as a high-production race. Getting colonies going is particularly important. In newly-conquered colonies, where anger and poor morale sharply reduce productivity. So here are some tips on how to speed up production, and how to avoid bankrupting your empire in the process. The Colony List is the best screen in which to buy things. Using it encourages you to look first at everything you need to consider before committing yourself to a specific purchase, including what else you might want to buy instead. You can see at a glance what is affordable and what's beyond your means. The round buttons just to the left of the scrollbar are the "Buy" buttons, and the ones beside things you can't afford are dark gray. If you can afford more than 1 purchase in the same turn, the Colony List makes it easy to go from one purchase to the next instead of hunting for colonies via the main Galaxy screen. First of all, don't buy if the bottom right box in the Colony List shows negative Income and your Reserve is under 200 BC - that sounds like a lot in the early game, but fast building means a fast rise in the total maintenance cost of your buildings, which will make the budget deficit worse; 200 BC can vanish very fast. There are a few situations where that rule can be interpreted flexibly. The most common one is where your deficit is entirely caused by moving colonists around and your budget will return to surplus when they arrive. But if you're not 100% sure, don't buy yet: you might want to move other colonists next turn, so the deficit might not be so temporary; and the purchase will be cheaper on the next turn (see below). If your finances are in good shape, the best time to buy is usually when the thing is 50% complete - another advantage of using the Colony List is that just looking at it every turn soon gives you a good feel for how long things take to build. Buying something that is at least 50% complete costs 2BC per outstanding PP; but buying things earlier gives you a much worse ratio, and buying things you've just ordered (no turns of production completed) costs 4 BC per PP - not even a DemoCash race can afford to do this often. When you click the "Buy" button, you'll see a dialog box that asks "Do you want to buy X production for Y BC?" If Y exceeds 2X, the item is less than 50% complete. But often you should look at purchases from a completely different point of view, as "Buying the right things" (below) explains. Usually what you're really buying is time — the main exception is when an enemy fleet appears and you urgently need some defense; then you're buying survival, if you can afford it. Suppose for example your real objective is to produce a colony and get an Automated Factory built there as soon as possible, either so that you can build defenses at a frontier colony or so that you can speed up Housing. Buying a 50% complete Colony Ship gains you at most 8 turns (5-6 if your empire is Feudal or hyper-production) for a cost of 500 BC (333 BC if you're Feudal); buying a 50% complete Colony Base gains about 3-4 turns (2-3 if you're hyper-production) for a cost of 200BC; buying an Automated Factory after just 1 turn of production typically gains 29 turns (less if the planet's rich or you're hyper-production; more if the planet's poor or High-G) at a cost of about 220 BC! And if you wait a couple of turns before buying the Automated Factory, you typically gain 27 turns for under 200 BC! The general rule is: look at the sequence of things that have to be built in order to get to where you want to be; if there's a mixture of cheap and expensive items in the sequence, buy the cheapest item early rather than an expensive one at 50% complete. The Automated Factory example illustrates another important principle: arrange the sequence so that cheap items which boost production are early in the sequence and buy these early. When you're planning new colonies, you have to keep the sequence in your head. Once a colony is built you can use its Build Menu to maintain the sequence of items. 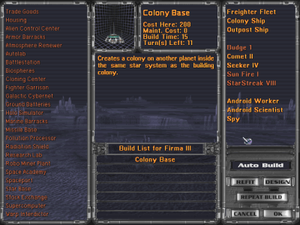 The Colony List allows the player to access any colony's Build Menu by clicking the colony's "Building" box (the "hand" cursor is about do this in the example above). Automated Factories are almost always the best candidates for early buying. This is important in the early game, when you have so little cash and so much to build. It becomes important again when you start invading, but that will be covered later. Money matters gives some tips about fund-raising. It's almost always useful to find ways of stockpiling production, for example so that you can construct defenses or productivity-boosting buildings quickly after you finish researching them. Unlike some games, MOO II imposes no penalties for switching production from one item to another, and 100% of the completed PPs are transferred to the new item. In other words, stockpiling work so well in MOO II that you can't afford to ignore it. If your race is not Tolerant, pollution is almost always a constraint on how fast you can build, unless you have the absolute top-of-the-range pollution-control tech. 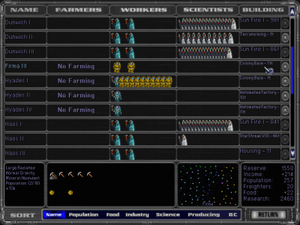 For example a large, rich planet with all 3 earlier pollution-control techs and a non-Tolerant population starts losing production to pollution when production reaches about 130 PP per turn - which is not a huge production rate, for example at that rate it takes about 10 turns to build a well-equipped Battleship. So it's more efficient for non-Tolerant colonies to built continuously at a rate that incurs no pollution penalty. The most obvious objection to stock-piling is, "But surely that slows down your research." In most cases after you discover a new tech you gain nothing until you've built whatever that tech allows - your objective is really to build an item, not just to research how to build it. In such cases you're better off if you accept a small percentage reduction in your research rate in return for halving the build time (or usually better than halving). The main exception to this is Tolerant races, whose immunity to pollution allows them to research flat out and then switch to building flat out. But some features of how research works in MOO II makes that approach slightly inefficient. The best stockpile is the most expensive item your technology allows you to build. For colonies with Starbases usually that's the most expensive warship you can build. And for a lot of the game that's a militarily useless battleship design with: Battle Pods if available, to increase the amount of expensive equipment you can include and thus maximize the cost; no shields or other special systems, as these are bulky but relatively cheap; usually the maximum number of the weapon that has the highest ratio of cost to space. Important note: when a colony firsts orders a warship as a stockpile item, check that the build cost is as high as you want it to be. Existing weapons and other ship systems get smaller and cheaper as you do more research. That's great when you're producing real warships; but it means your stockpile items keep getting cheaper, so you have to re-design them to increase the amount of PP they can store. This issue only arises when you first add a stockpile item to a colony's build queue; stockpile items already in build queues don't get cheaper. For colonies without Starbases the best stockpile item is a usually a Battlestation (1000 PP) if you have that technology or a Colony Ship (500 PP) if you don't - but these are rather cheap for stockpile items, and you have to be more careful not to make them accidentally (see below). Check the Colony List every 2 turns or so. If you click "Producing" it will sort the colonies in order of what they're building, so you can see easily all the ones that are in danger of completing an unwanted stockpile item. Move all workers into research. But the colony will usually have an Automated Factory and/or Robo-Miner that keeps producing PP even when unmanned. Housing would be a good choice if you have colonies with plenty of spare room. Housing and Trade Goods use all of a colony's current production, but won't bite into the stockpile. Trade Goods converts every 2 PP into 1 BC. Colonies usually get close to finishing stockpile items around the time you're preparing to attack (assumimg you're not a blitzer), and offensive war is expensive: during the build-up your fleet (including Troop Transports) may well increase faster than your production of Command Points, so you have to spend a lot on fleet maintenance; and getting newly-conquered colonies working decently often requires you to buy a lot of items, sometimes well before 50% complete. Troop Transports (100 PP; 1 CP) will be required if you're preparing to invade, but they cost command points so it's best build them at several research/farming colonies just before your main shipyard colonies deliver the warships. So Trade Goods is preferable until the final few turns of the build-up. Spies (100 PP; maintenance 1 BC) are sometimes a good alternative, especially for colonies that are so far away from planets you want to invade that you don't want to build Transports there; but maintaining lots of Spies is expensive. Freighters (50 PP) are often a good idea: they have no running cost while not in use, and you'll need them when you start invading (see Freight training). If you want to stockpile further than your most expensive item (say, to build your first Titan), you can repeat-build a cheap item (such as a completely empty frigate). You'll generate more PP than you spend building the ship, which will be stockpiled and dumped into your next large-PP item. You can either scrap your frigates, or use them to quickly board immobile unmanned ships or draw fighters away from your fleet. Enemy A.I. will not prioritize unarmed ships, so they can move relatively freely around the battlefield. This page was last edited on 9 April 2019, at 17:02.